Rhodes or Rhodos or Rodos is the largest of the Dodecanese islands, and easternmost of the major islands of Greece in the Aegean Sea. 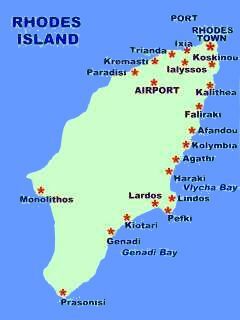 It lies approximately 11 miles west of Turkey, situated between the Greek mainland and the island of Cyprus. Its population in 2004 was estimated at 130,000, of which between 55,000 and 60,000 resided permanently in the city of Rhodes, the main commercial and population center. Rhodes is the capital of the District of the Dodecanese and of the Province of Rhodes, which also includes the nearby islands of Symi, Tilos, Halki, and Kastellorizo. Medieval City of Rhodes The Order of St John of Jerusalem occupied Rhodes from 1309 to 1523 and set about transforming the city of Rodos into a stronghold. It subsequently came under Turkish and Italian rule. With the Palace of the Grand Masters, the Great Hospital and the Street of the Knights, the Upper Town is one of the most beautiful urban ensembles of the Gothic period. In the Lower Town, Gothic architecture coexists with mosques, public baths and other buildings dating from the Ottoman period .